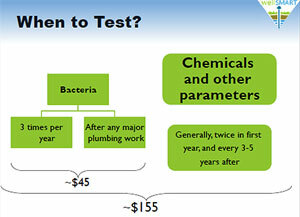 Private well owners have the responsibility to test their well water on a regular basis. A sterile bottle must be used to collect a sample which must be at the Lab for analysis the same day it is taken. Private well owners should also see our wellSMART page for more information. In the 8 RDN water service areas, water quality is tested on a regular basis to ensure a safe supply. Please see our water quality tests page for more details. Small water systems (such as campgrounds, trailer parks or restaurants that have their own water supply that they provide to others) are regulated by VIHA to test for drinking water quality parameters.